The division of labor happened naturally. I’m an enthusiastic cook who married a (tall, handsome, sweet-natured) neat freak. Lately, my partner’s deep-rooted desire to scour and organize has him toiling away in the basement, mostly going through the kids’ old toys, reuniting Barbie dolls, returning boardgame pieces to their boxes, and squirreling toys he’s convinced the kids will never play with again into bags to take to Goodwill. This last quest has become, by necessity, a furtive mission. Both kids, but especially my daughter, would have a fit if they knew what he was up to. They don’t want to give anything away, not even the baby toys. “They’re too special,” Lily would cry. When it comes to the Thomas the Train sets, my husband and I actually agree with her. Never mind that the kids no longer play with the tracks and miniature engines. 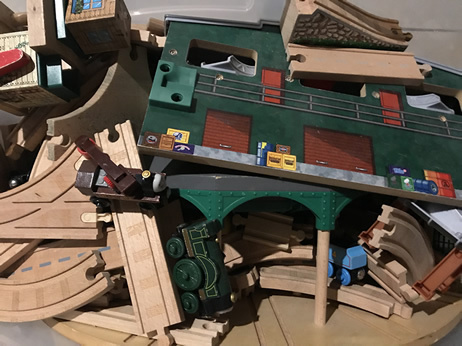 We’re keeping the big bins of Thomas the Train pieces FOREVER, and not just because they’re nice to have on hand when friends with little ones come over. More than that, they are the stuff of some happy memories. Only a few years ago, on a regular basis, the kids (and Michael or me, if they wanted help) would spend hours situating the wooden tracks across the master bedroom floor, growing a toy transport system in complex ways, laying short lines and long stretches, curving and overlapping the rails, one day winding a track under the bed, and another day twisting it around the chair. The configurations would incorporate ramps, switch tracks, the colorful Thomas the Train destinations—drawbridge, crossing gates, Cranky the Crane, stations, docks—and of course the odd-faced locomotives, hooked together and arranged on the track. And whenever the kids played with the trainsets, they’d be making up a story. Sometimes the day’s design dictated the plot, the passage under the bed, for instance, a dark tunnel and source of terror for scaredy-cat Ferdinand. Other times, the personalities they’d decided on for the trains would shape the storyline. Emily, I remember, was a real troublemaker. Mouthy, too. Anyway, we’re never getting rid of the Thomas the Train pieces. They’re too special. Lately, I’ve been thinking about those trainset days, particularly in the morning during my writing time. Instead of working on a new novel, I’m revisiting an old one that I wrote around four years ago. It’s a YA fantasy, tentatively entitled Leisureland, the first in a series I’m three-quarters of the way through drafting. Just this last week, I finally finished muddling through the middle of the manuscript. I can breathe a little easier now. That middle was a mess. Initially, I didn’t think I could do it, didn’t even want to—felt, in fact, completely overwhelmed by that midway can of worms: the world-building that was dragging down the pace, the one character’s tedious explanations (information that I needed to find ways to illuminate through action), and the many loose ends and extraneous additions that required tying up and cutting out. After some days of reading and rereading the middle portion, yanking on my hair, pacing, and sweating, I grimly dug in. In my notebook, I wrote, “Leisureland—thoughts” at the top of a blank page and jotted down questions and concerns (as I realized them), along with ideas, solutions, and threads-to-develop (as they came to me). I listed the information that wasn’t making the novel better and could consequently go, identified the intriguing bits that were worth further exploration, picked out moments that (with some heightened details) could turn slo-mo climatic, and pinpointed the tantalizing aspects that I’d too quickly reconciled, the mysteries that I could delay solving—in short, the opportunities to build suspense and therefore quicken the pace. This particular revision has taught me a couple of things. One, if I wrangle with a text long enough, no matter how unwieldy it is, how seemingly countless its issues, I’ll probably eventually find the means (and courage and confidence) to improve it. Two, the ways toward improvement aren’t necessarily new. In other words, the answers to the problems may actually already exist within the rough text: buried, perhaps, or misplaced or implied…but nevertheless there. Isn’t that fascinating? It was to me. It felt like an epiphany. I guess, if we writers can build plots, we can break them down, too. I just took apart a hundred pages or so, spread out the pieces, and started thinking. And playing. A familiar play. It was like watching my kids piece together tracks, sending some curved ones around the ottoman, attaching the forbidden bridge halfway there, then fixing a straight, boring stretch with the crossing signal that flashes lights and rings a bell, picking it as a good spot for an accident—overturned cargo, spilled treasure—or a fire or a fight or a new friendship, then adding the ramp to the section by the bureau because ramps are hard to chug up but fun to fly down, then looking around and marveling at what they built: an entire kingdom. This is cool. I wish it were real, a real place. We could go there, you and me and Mommy and Daddy.